There’s something quite fascinating about teardrop campers. They seem to capture the imagination of people from all walks of life – even those of us more accustomed to larger, more traditional rigs. They are still not hugely common on the highways and byways of Australia but their popularity has definitely grown in the past few years. Speaking as someone who thinks that we should be more proactive about downsizing, or at least reducing weight (both personally and in what we are towing! ), I have been interested to see what the manufacturers of smaller caravans and campers are up to in this area. 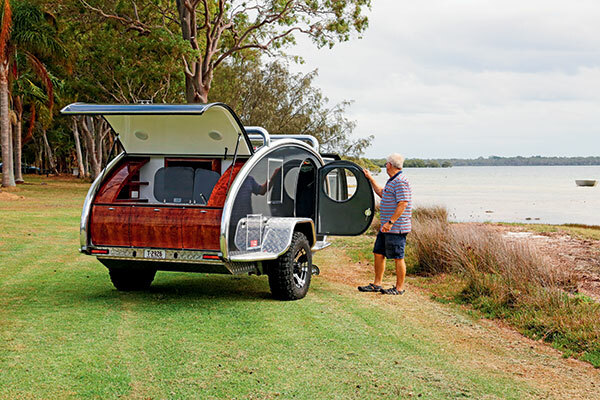 Gidget is a Brisbane manufacturer which builds all of its RVs in Australia. The company has been producing onroad teardrop campers for some years. Recently, the team has brought out an offroad range, the Brumby, which comes in two models – the standard Brumby and the Brumby Wild. 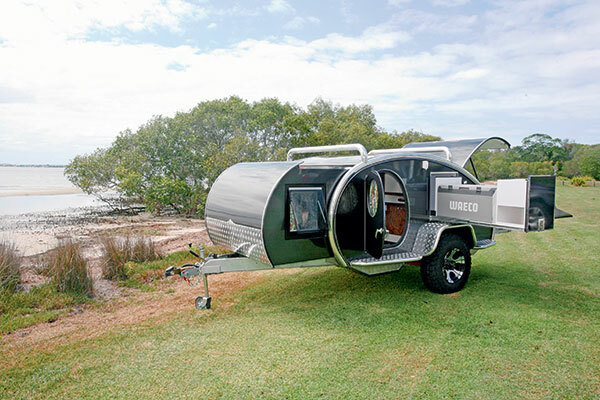 The Brumby Wild canters in with a Tare weight of 980kg and an ATM of 1400kg, giving a surprising (for a camper of this size) load capacity of 420kg. For my review, Gidget was kind enough to supply me with a Range Rover, a very classy vehicle, I’m sure you will agree! 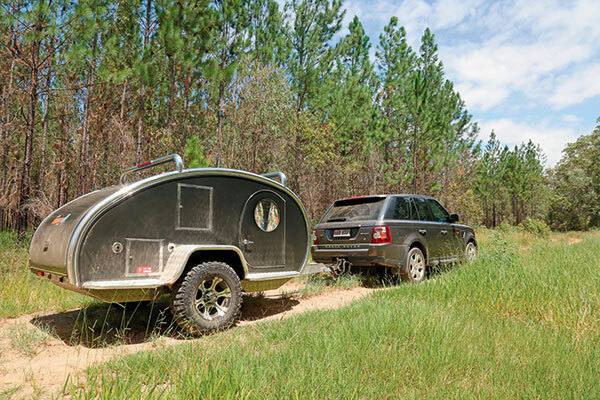 However, one of the great benefits of the little Gidget campers, even this offroad Wild, is that you can use a much smaller and lighter tow vehicle. Not far north of Brisbane, I found plenty of places to put the Brumby Wild through its paces. There are Bribie or Fraser islands for a start but, since I was riding solo, I opted for the forested roads around Caboolture, rather than hitting the sand, and this certainly gave me a good idea of the Brumby’s capabilities while out in the wild. One of the things that really impressed me was discovering the Brumby had airbag suspension – something which is usually only found on much bigger, heavier trailers. The Cruisemaster XT Air independent trailing arm suspension is fitted with quad gas shock absorbers, fully automated, remote-controlled auto levelling, heavy duty compressor, dual digital pressure gauge, an 8L air tank, tyre inflation coil and wand, wireless remote control and self-levelling features. It’s designed to make adjusting the airbag pressure, as well as inflating and deflating the tyres for offroad work, very easy. The Brumby’s body sits around the galvanised chassis, rather than on top of it, which is much more common. It’s necessary, however, because the air space between the rails is used for part of the camper body. The drawbar rails are 150x50mm (6x4in) RHS while the main chassis rails are slightly smaller at 100x50mm (4x2in) RHS. All the chassis rails and components are made of 5mm steel. 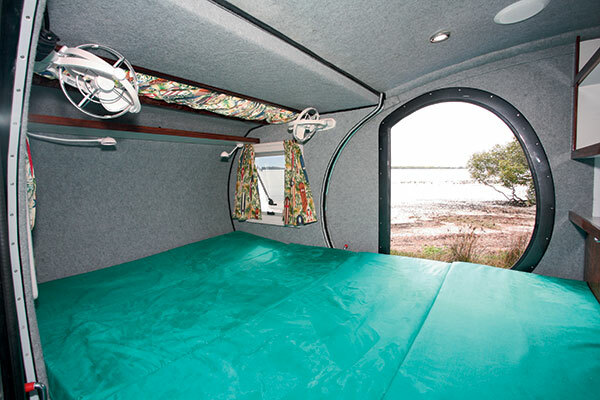 All Gidget campers have a fibreglass composite body with ply timber walls and fully moulded fibreglass components – and some come, as this one does, with a slide-out. 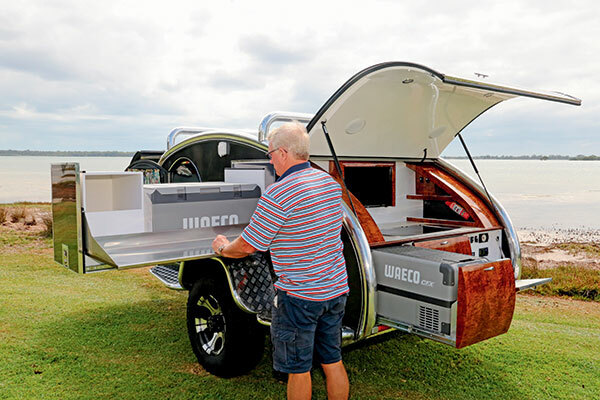 The slide-out isn’t in the rear or side wall, as per most caravans or hard shell camper trailers, but into the front wall, effectively and cleverly using the air space above the drawbar. Apart from its shape, one of the things that give the Brumby Wild its characteristic look is the retro mudguards, the glossy black finish and the fat chrome roof racks. Setting up the Brumby Wild is very easy. Lift the rear door for access to the rear kitchen and pull out the front slide-out. It’s just a matter of releasing the restraining bolts inside both doors and pulling from the front. Handily, the Batwing awning that can be fitted off the roof racks takes less than a minute to set up. 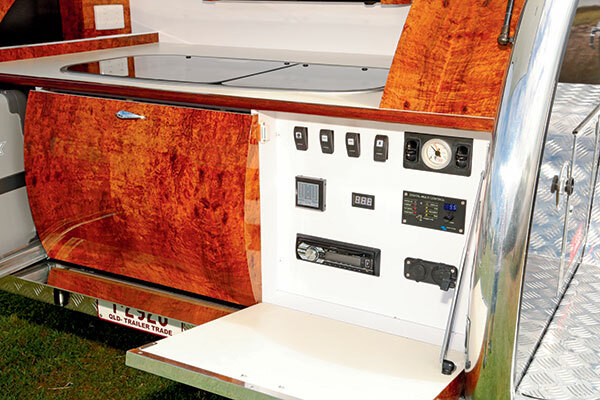 The front of the camper holds the bed, which measures 2.05x1.49m (6ft 9in x 5ft) and comes complete with side windows and reading lights at the head. The bed is made up of three cushions and two hinged floor panels which, if moved and lifted, create a very comfortable two-person lounge facing the entertainment panel and comes complete with a foot well. When it’s not being used as a footwell, it can be used for storage. Along the rear wall there are plenty of storage compartments, including one for the battery charge and 12V fuse panel. 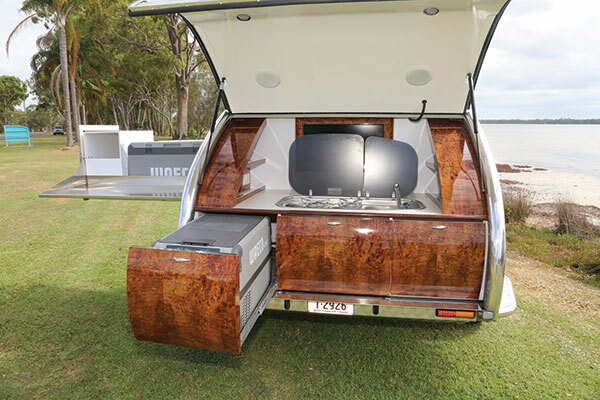 The Brumby Wild’s kitchen area comes with a cooktop/stainless steel sink and two fridges, a 35L Waeco and a 95L Waeco – one on a slide-out at the rear and another on a slide-out that fits across the camper behind the kitchen bench. That certainly gives great fridge capacity for the long-term camper. 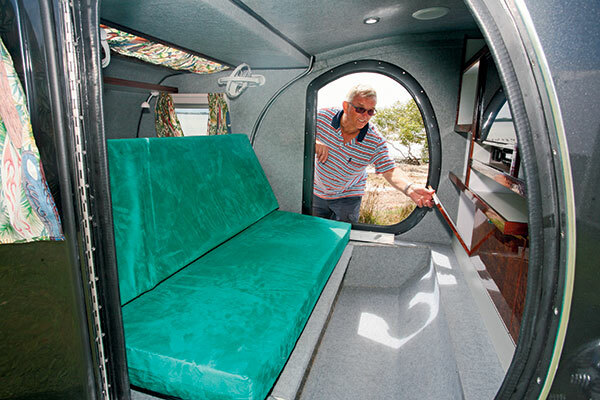 The internal bedroom and lounge defines the appeal of the teardrop camper. There’s no flapping canvas like in a camper trailer and everything stays warm and dry inside. There’s no doubt in my mind that a teardrop like the Gidget Brumby Wild is the next successful step up from the on-road teardrops. It is best enjoyed in warm/fine weather but it could equally well be used in cooler areas, especially considering its offroad ability. You can find the full review in Caravan World #563. Subscribe today for the latest caravan reviews and news every month!